Okay, I’m really excited about the Kruise…the closer the date gets, the more excited I get! You can still purchase Boarding Passes…just call the shop (651) 457-4969! The winners of the SWTC Tofutsie Boot Camp Sock Kits are Louise & Maya…Thank you to everyone who particpated! I am proud to introduce a new, fun product, available exclusively at 3 Kittens…the 3 K Koolerz kits! Each kit will produce a one-of-a-kind scarf, perfect to wear year round. 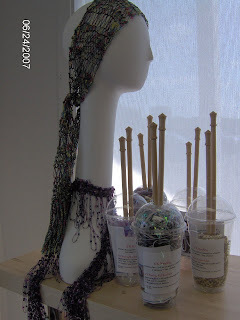 Priced at onlly $20, you receive 2 patterns, size 15 needles, and 150 yards of fun yarn. Great for gift giving!! < Previous >Only 8 More Days until 3K Karabella Kruise!! Next > >Only 4 More Days Until We Kruise!